Do you have a moment? Just a little time to chat, I won’t keep you long. You’ve got things to do, I know. Set it aside a moment and walk with me. Listen, I don’t want to preach. I know what it’s like to be young, how everyone seems to have some kind of advice for you and everyone wants to tell you how to live your life. But I’ve got a few things to say, if you’re willing to listen. I am not going to lie to you, it’s quite possibly the most dangerous age to be, ever. It’s dangerous waters from 18 to at least 22, but 19 seems to be the age where it all goes wrong. Ask an adult…I’ve polled quite a few. If you’ve made a Big Mistake in your life, it’s likely to have been at age Nineteen or thereabouts. I know this first-hand, I made the biggest mistakes of my life at nineteen (and, frankly, most of the runners-up as well). Here’s the deal: I know you’ve been an adult for just about a whole year now. And you’ve made it through the year successfully, you’re not dead and you’re not in jail and by now you’re feeling pretty confident in your ability to deal with this whole life thing. You’ve got this adult thing totally under control, and you’re ready to loosen up and relax about it. Except for one thing: You’re Nineteen. 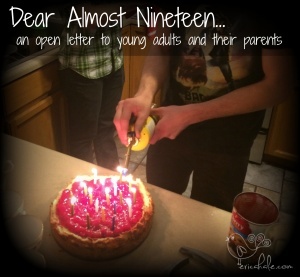 Here’s the problem with Nineteen, and please don’t take this the wrong way. You are navigating adult-ness right now with a brain that’s only processing as an adult about half the time. This, Child, is not your fault. We humans are wired that way, and in fact none of us will develop a whole-adult brain until somewhere around the age of 25. Until then, we’re yanked back and forth between thoughts and decisions that are sometimes startlingly mature, and at other times shockingly childish. That’s the nature of the beast. And you can’t predict if your adult-brain is going to be in charge at any given time, or if your child-brain is going to be in the driver’s seat. That’s a precarious place to be. You are not going to know the difference at the time, either. It’s all going to seem totally rational to you. Add to this the fact that the expectations for you at this age are discouragingly low, you may be spending most of your time away at school with a bunch of people who are in the same precarious age group, and that a good many of your peers are going to be struggling with issues you never saw coming…well, you’ve got a recipe for potential disaster. And you are navigating all this with half-a-brain. Right around now a lot of you will be going into your Sophomore year in college, and it’s no accident that the word itself is derived from the Greek words for Wise (sophos) and Fool (moros). Wise-fool, here’s what I want you to know: You can do this thing, you can keep on track but you’re going to need to go into this with caution. Get your people behind you, your support system. Tell them that they have your permission to tactfully tell you that your child-brain is currently at the wheel, when they see reason for concern. And when they do speak up, listen to them. Here’s a secret: It can take courage for a parent to speak wisdom to their child, even when they know it’s truth. It’s not as easy as it looks. With this in mind, I beg you…Set aside those Big Life Decisions for a year or two, if at all possible. Know that you are right now going to have to exercise some serious adult patience in situations that try the patience of even the most seasoned adults, and you’ll be expected to do this when your brain might, at any given time, flip into child-mode and want to sneak under the Christmas tree and secretly unwrap those tantalizing gifts a week early. It’s not fair, and it’s hard, but at its best it’s kind of like boot-camp that will shape you up and help kick you, well-prepared, into that next phase of life. Parents…here’s a bit of advice as well. Your job is never going to be done, but for certain right now is not the time to hang up your hat and call it a day. Check in and stay checked in, even though our culture is telling you that teens will be teens and we should expect the worst. It doesn’t have to be that way. Start talking to them about these perilous years early on, and keep talking right on through. Listen to their ideas and enjoy the adult conversations you’ll be having, but don’t do them the disservice of allowing them to get off track because they’re legally adults and should be able to figure it out on their own. Have the courage to speak up and help them remember who they are, and Whose they are. Parents, let's stop looking at our teens as ticking time-bombs and start partnering with them as young adults. Click To Tweet If we stopped looking at our teenagers as ticking time-bombs and started partnering with them as young adults who are learning to navigate through hard, adult situations, I’m convinced we could save both parties a lot of heartache. Because our culture has such a low opinion of teens, we’ve been ingrained with the tendency to disrespect them and minimize what they’re going through. How can we expect them to respect us, if we can’t set an example by respecting them? Let’s promise to hold our young adults to high standards and keep our discussions rooted in Biblical truth, because this is the time they need it the most. Let’s make a promise to each other, let’s prove the world’s view of teens and young adults wrong. Click To TweetLet’s make a promise to each other, let’s prove the world’s view of teens and young adults wrong. Let’s work together instead of falling apart, let’s act with respect and love. Let’s not give up on each other. A note: I’m not a perfect parent and I don’t have perfect kids, but we have made a point to discuss this stage of life with our kids from an early age. 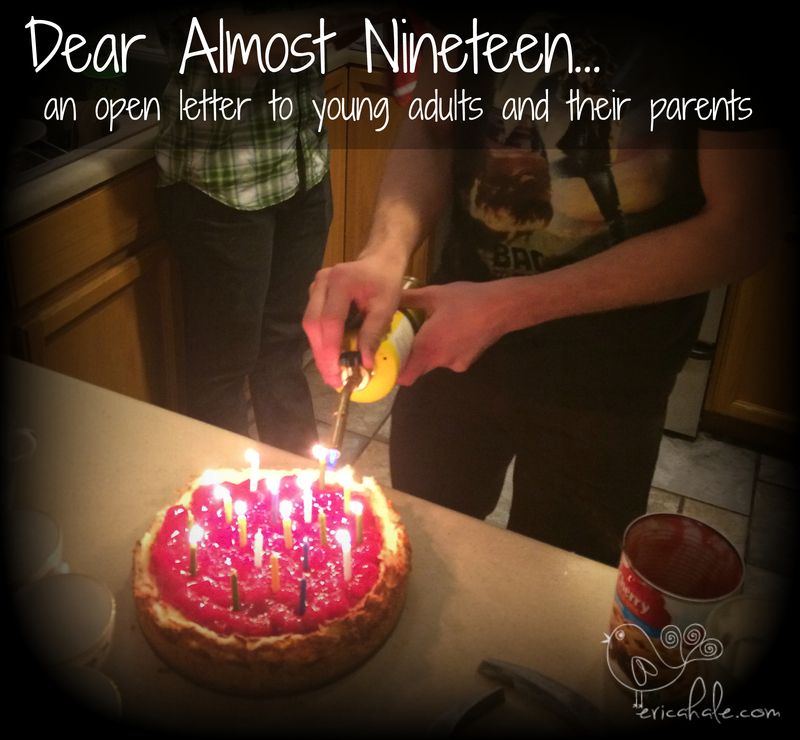 I promised them that I would remind them about 19 if the need arose and they promised to listen…Eldest is now 20, and we’ve found that commitment to be a huge blessing. It’s never too late, but if you can start these conversations when your kids are early teens or tweens it will make a huge difference when they’re older!